In the motets of Philippe de Vitry, Guillaume de Machaut, and their contemporaries, tenors have often been characterized as the primary shaping forces, prior in conception as well as in construction to the upper voices. Tenors are shaped by the interaction of talea and color, medieval terms now used to refer to the independent repetition of rhythms and pitches, respectively. The presence in the upper voices of the periodically repeating rhythmic patterns, often referred to as "isorhythm," has been characterized as an amplification of tenor structure. But a fresh look at the medieval treatises suggests a revised analytical vocabulary: for many fourteenth- and fifteenth-century writers, both color and talea involved rhythmic repetition, the latter in the upper voices specifically. And attention to upper-voice taleae independently of tenor structures brings renewed emphasis to the significant portion of the repertory in which upper voices evince formal schemes that differ from those in the tenors. These structures in turn suggest a revision of the presumed compositional process for motets, implying that in some cases upper-voice text and forms may have preceded the selection and organization of tenors. Such revisions have implications for hermeneutic endeavors, since not only the forms of motet voices but the meanings of their texts change, depending on whether analysis proceeds from the tenor up, or from the top down. Where the presumed compositional and structural primacy afforded to tenors has encouraged a strand of interpretation that reads the upper-voice poetry as conforming to, and amplifying, the tenor text snippets and their liturgical contexts, a "bottom-down" view casts tenors in a supporting role and reveals the poetic impulse of the upper voices as the organizing principle of motets. 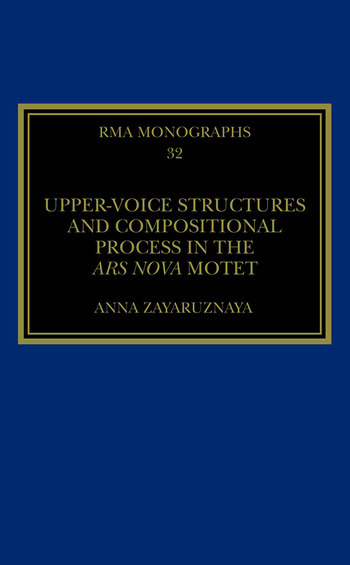 Anna Zayaruznaya is interested in the cultural and compositional contexts of late-medieval song. Her first book, The Monstrous New Art: Divided Forms in the Late-Medieval Motet (Cambridge University Press, 2015), explores the roles played by monstrous and hybrid imagery in fourteenth-century musical aesthetics. More recent publications center on Philippe de Vitry (1291–1369), a poet and composer well known to music historians as a pioneer in the development of musical notation. Zayaruznaya received a PhD from Harvard University in 2010 and teaches at Yale University, where she co-convenes the Medieval Song Lab, an interdisciplinary working group focused on the history of musical notation. Her awards include the Van Courtlandt Elliott Prize from the Medieval Academy of America, the Gaddis Smith International Book Prize from the MacMillan center at Yale, a Project Grant from the Digital Humanities Lab at Yale, and a fellowship from the Radcliffe Institute for Advanced Study.